Mobile Phone Users: Tap the following number to contact us: 010-365 8513. VOIP transmits voice over the Internet. As you talk, your voice is broken down into packets, like creating small sound files. The packets are then sent through the Internet. Each packet may take a different path from the other packets. Depending on the path taken, a later packet may arrive earlier than an earlier packet. At the receiving end, the packets are reassembled. The reassembling process must wait until all packets have arrived, before delivering to the person who should receive it. This often results in a delay before the receiving person can hear what has been said. For this reason, while VOIP can be used to make a cheap international call from Malaysia, TM Smart Call is the better alternative. VoIP stands for Voice over Internet Protocol. It is actually made up of many different protocols, some open and some proprietary. Today, the most popular protocol is the Session Initiation Protocol (SIP). SIP is suitable for voice and video calls over Internet. It can also be used for video conferencing, streaming multimedia distribution, instant messaging and file transfer, among others. Since VoIP calls are made through the Internet, it can be provided at a low rate. VoIP, as a result, becomes attractive to companies with high telephone bills. This has caused many companies to convert to the low rate VOIP in order to reduce their telephone bills. However, since VoIP is dependent on the Internet lines, a slow Internet connection can cause availability problems. Many people who use the Internet have already used VoIP. Those who place calls through SKYPE or Yahoo Messenger are using VoIP. VoIP phone users can make calls from anywhere there is a broadband connection. To understand how VoIP really works and how it is different from the traditional PSTN telephone system, it helps to first understand how PSTN works. Existing telephone systems are driven by a very reliable and tested method for connecting calls called circuit switching. Circuit switching is a matured technology that has been used by telephone networks for more than 100 years. 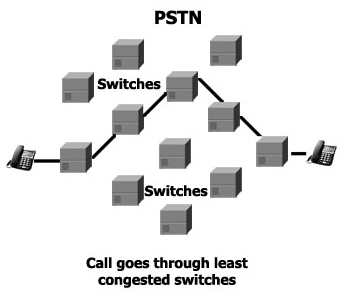 When a call is made between two parties, the system chooses the least congested path and the connection is maintained for the duration of the call. Since you are connecting two points in both directions, the connection is called a circuit. This is the foundation of the Public Switched Telephone Network (PSTN). Availability and voice quality of PSTN networks are very high. The sending computer chops your voice into small packets, with an address on each one telling the network devices where to send them. When the receiving computer finally gets the packets (which may have all taken completely different paths to get there and a later packet may have reached the receiving computer earlier than an earlier packet), it uses instructions contained within the packets to reassemble the data into its original state. As can be imagined, some packet can be lost or delayed, and the reassembling process will have to wait. In other words, there can be a delay before the voice message is rearranged and delivered to the recipient at the other end of the line, and your conversation is no longer smooth. This is just a brief description of what is VoIP. It is meant only as an introduction to what is really being offered by the cheap VoIP (when compared to normal rate PSTN) and why PSTN is still the better choice, especially now that Telekom Malaysia has introduced TM Smart Call that is as cheap as VoIP. For more information, call 010-365 8513 NOW!